We manufacture and install wire window grilles to protect against malicious or accidental damage. We take care to make accurate templates of each opening to ensure a close fit to the masonry openings. This ensures that the wireguards are as invisible on the exterior of the building as possible. We use 12mm x 50mm stainless steel weld mesh that is finished at the perimeter with 5mm wire. The wireguards are finished with satin black polyester powder coating and are fitted using custom made stainless steel clips and screws. 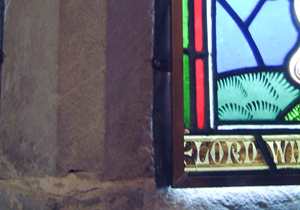 Historic stained glass may be vulnerable to atmospheric conditions. Of particular concern are medieval glasses and glass with loosely adhered glass paint. 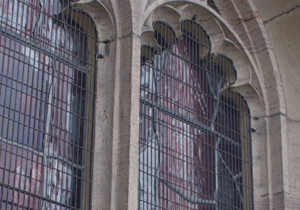 Further deterioration can be halted by protecting the stained glass with new external secondary glazing. The original glass can be re-sited just to the inside of the new external glazing. With carefully considered ventilation flow around the original glass it can be protected from further damage.